(Anderson 1999) (Intersectional) The coppery orange and red overtones of this unusual intersectional get raves in the garden or as an unusual cut flower; gets 32 inches tall by 48 inches wide; vigorous originator's stock. (Wissing 1965) Intensely coral semi-double with a rosy infusion that add a sunset glow to the color; large dramatic blooms in some seasons are so full of petals, the flower looks double; reaches 32 inches tall and, like all of the corals, needs its first year to grow good roots, so don't expect much on top the ground. 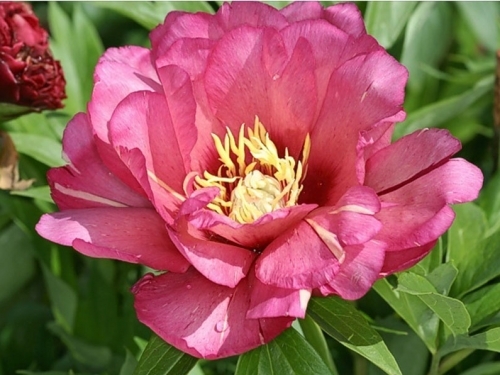 (Anderson 1999) (Intersectional) This cross hybrid has a complicated and variable coloration of shimmering cream, maroon and red throughout the petals, which surround a center of ivory carpels tipped green; it stands out easily among other peonies; originator's stock.